If you're in charge of Thanksgiving dinner this year, use these shortcuts to cut down on time and mess. These tips will help you create an impressive feast with less stress. If you're making mashed potatoes, consider skipping the tedious peeling step―as you know, most of the nutrients are in the potato skin. It's all a matter of preference, but mashed potatoes can taste good with skins as long as you use thin-skinned potatoes such as Yukon Gold. Clean and scrub the outside of the potatoes and then chop, boil and mash. Cooking your stuffing inside your turkey makes the bird take longer to cook. Instead, just cook stuffing in a casserole pan or on your stovetop. Bread stuffing arguably tastes better when cooked on its own; it's less likely to get too soggy. For a special twist, bake stuffing in a muffin tin; you'll get 12 crispy individual servings from one box of bread stuffing mix. The hardest part of preparing Thanksgiving dinner is making the turkey. It's not every day that you have to roast a massive bird for several hours. As a general rule of thumb, find a turkey by adding two pounds for each guest. 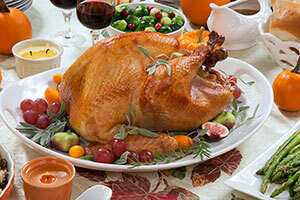 Larger turkeys from 15 to 20 pounds have a higher meat-to-bone ratio, so you can get by on one pound per guest. For faster thawing and cooking, feed a large crowd with two small turkeys instead of one oversized bird. While turkey is notorious for easily becoming overcooked and dried out, it does not have to be that way at your house. Roast your Thanksgiving turkey breast side down first. This allows the juices to cook into the breast. Brining also ensures moistness and full flavor. Short on precious oven or stovetop space? Your rice cooker and crock pot can be used to keep foods hot. With all the prep time and cooking on Thanksgiving Day it's common for some food to get cold before it's served. Just set the temperature on your rice cooker or crockpot to the lowest setting to keep stuffing and mashed potatoes hot until every guest is seated and dinner is served. Timing is everything when you're cooking multiple dishes for a party, so make a plan and start early. Prepare side dishes, desserts, and stuffing up to two days before Thanksgiving. Pre-chopping vegetables and herbs will also cut down on prep time and clean-up.